Knit Up & Dye Podcast, Yarn & Knitting Patterns: Halloween 2009 - Attack of the Killer Carrot! This isn't one of John's black and white horror films... this killer carrot was harvested from our garden Halloween 2009. To preserve our harvest, we sliced all of the carrots not destined for salad and dried them in the dehydrator. I will enjoy many months of carrot in soup! 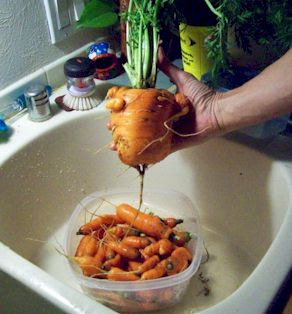 We look forward to planting more carrots in the spring.